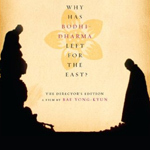 Even with its striking visual appeal and peaceful Buddhist philosophy, Why has Bodhi-Dharma Left for the East? is a difficult movie to embrace and one that requires quite a bit of patience. What’s it all about? In brief, the movie tells the story of an elderly monk nestled in a hermitage high up in the mountains near a bustling city, a young orphan he adopts, and a city-dweller in search of his soul. The boy goes through his own spiritual quest after throwing a rock at a bird and killing it. Realizing the gravity of his mistake and weighed down by bad karma, the boy goes on to be teased and nearly drowned by a gang of children. As for the city-dweller, he became fed up with life “in the world” and wanted to steer away from the shackles of worldly pursuits and heartaches, including the responsibility of caring for his blind mother. By going up to the hillside monastery, he instead looks after the old monk’s well-being while learning Zen philosophy. For all the movie’s artistic aspirations in contrasting the chaos of city life with the solitude and serenity of the hillside monastery, it works best during the scenes of dialogue between the monk and his apprentice. That’s when the Zen philosophy is more openly transferred to the uninitiated viewer. But even then, those lessons are wrapped in enigmas and hidden meanings, making this cinematic attempt at expressing Buddhist philosophy more valuable to those in the know than to the more casual, curious observer. Granted, Zen is a concept that cannot be fully articulated in words, so writer/director Bae Yong-kyun has sought to present the heart of the matter through the movie’s characters and their interactions with others and nature. Yong-kyun has said, “I would like the audience to see the film without preconceived knowledge or ideas.” Well, in this case it’s best to have some foreknowledge to more fully enjoy and understand the movie. The ultimate lesson seems to be a simple one, reflecting on the eternal theme of ashes to ashes, dust to dust, that life has no beginning and no ending. The concept is universal, the presentation very Eastern. Can Bodhi-Dharmi leave for the West and make an impact? Well, certainly for some the answer is a resounding “yes.” The movie, first shown in the United States back in 1993, has received plenty of high praise and some consider it one of the ten best movies of all time. Even so, for all its charms, fine cinematography, and the purest intentions in the history of cinema, it’s a challenging movie to watch. At one point the old master tells his pupil that perfection can be achieved by embracing all things and loving life’s anguish. That is certainly a compelling concept but, while the movie does become more interesting as it moves along, it’s a shame it’s not more accessible to lay audiences. By presenting the “director’s cut” of the movie, featuring an additional 10 minutes of footage, and remastered for 16:9 clarity, this DVD edition effectively makes obsolete a previous release from five years ago. However, there are no supplemental features. A director’s commentary linking the events of the movie to various aspects of Buddhist philosophy would have made this edition far more valuable in reaching a larger audience. The movie has been enhanced for 16:9 TVs and the picture nicely replicates the lush visuals and scenery. Considering the movie dates back to 1989, it has aged well. The DVD is presented with Korean language tracks available in Dolby Digital 5.1 and 2.0 stereo; contrary to the DVD’s jacket description, a DTS track is not available. Nonetheless, the 5.1 track beautifully surrounds the viewer with the sounds of the mountain winds and rushing rivers. Optional subtitles are available in English and Korean. Watch. Think about where you’re going and what you’re chasing after.